After World War II, the United States government and citizens owned as much as 80% of the gold in the world. 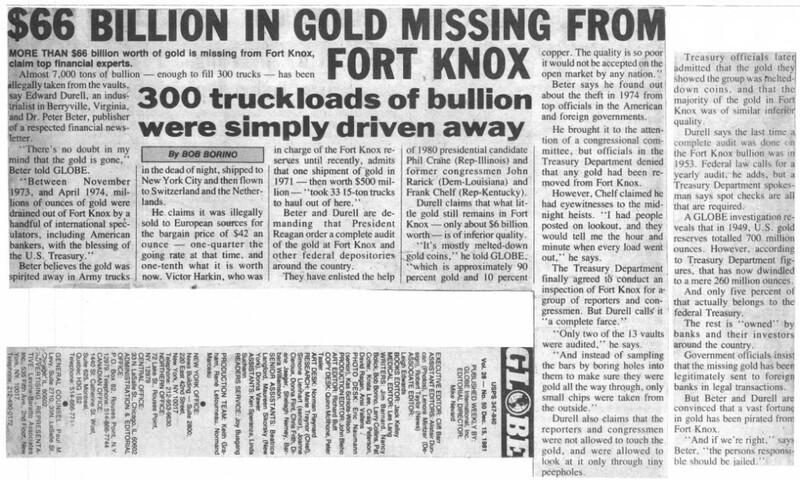 More than half of the gold was stored at Fort Knox. Many in high places have suggested there is precious little gold in those vaults today. since the Eisenhower Administration (1955). HOW MUCH GOLD IS LEFT IN FORT KNOX? It would be a good idea for Congress to find out if the U.S. really owns as much gold as is reported. Congress should audit Fort Knox (60% of total reported gold), Denver (18%), and West Point (22%). Many times since 2008, the United States Mint has been seriously backlogged with orders for American Silver Eagle coins and American Gold Eagle coins. This would lead one to suspect the U. S. substantially overstates the amount of gold and silver it owns. ARE AMERICA’S GOLD RESERVES IN PRIVATE HANDS? The U.S. is listed as the largest holder of gold in the world. In 2005, the U. S. Treasury claimed to have 261.5 million oz. of gold. According to published figures, America owns 10,792.6 tons of gold. President Reagan’s “Gold Commission” would have disagreed with those statistics. In 1981, the President pursued an investigation of a return to a gold standard. He appointed the “Gold Commission” to examine the books of the U.S. Treasury. The commission came to the conclusion the U.S. Treasury owns almost no gold at all [only a small amount of gold at the U.S. Mint]. The Federal Reserve holds whatever gold is remaining at Fort Knox (etc.) as collateral against the debt America owes to the privately held central bank. CONGRESS SHOULD FIND OUT. What is the truth? Are U.S. gold reserves in the private hands of central banks such as the Federal Reserve? Mining sources report 8,000 tons of gold have left the country since 2007. Congress must audit Fort Knox and the Federal Reserve. Gold and silver money are required by the U.S. Constitution. Article I, Section 10 of the Constitution requires legal money: “No State shall… make any thing but gold and silver coin a tender in payment of debts…” In 1792, an Act of Congress defined a legal dollar: 0.7734 Troy oz of silver -or- .04375 Troy oz of gold. In 1933, an unconstitutional law forced U.S. citizens to hand over tons of their personal gold to the Federal Reserve Bank of New York. After Americans turned in their gold at $20.67/oz, the price of gold was raised to $35 per ounce (1934 Gold Reserve Act). The government made a huge profit by raising the price of gold 69%. The ESF funds the Central Intelligence Agency (CIA). were transferred to the ESF. were transferred to the IMF. The ESF and U.S. gold. The Exchange Stabilization Fund was designed by Harry Dexter White, and established by the Gold Reserve Act, January 31, 1934. Sec. 7 amended the Gold Reserve Act. 8: The amendment directed the Secretary of the Treasury to pay $1.8 billion ESF capital in the form of gold, July 31, 1945, p.135. IMF gold subscription: The U.S. paid $275,000,000 June 1946 (Treasury AR 1946, p.83); $687,500,000 in gold Feb.26, 1947; $280,500,000 gold-backed cash Feb.26, 1947; $1,782,000,000 in gold-backed notes (Treasury AR 1947, p. 48). The private Federal Reserve Bank participates in U.S. foreign policy decisions, monetary policy, and foreign loans: Section 4(a) of the Gold Reserve Act created a National Advisory Council “to coordinate the policies and operation in making foreign loans or engage in foreign financial, exchange or monetary transactions.” The council included the Chairman of the Federal Reserve Bank. Planning for Postwar Economic Cooperation: U. S. Treasury, the Soviet Union, and Bretton Woods 1933-1946, Peter Josef Acsay, Saint Louis University Digest 2000, Center for Financial Stability. Agreements such as WTO, NAFTA, CAFTA, SPP, and TPP transfer sovereign management of U.S. trade to trans-national corporations and the United Nations. Global governance is far more than just changing the world’s economy over to a single currency. An “empowered U.N.” is a euphemism for worldwide force. Internationalists anticipate the disarmament of all member nations… including the United States. More than half of America’s solders already serve under the banner of the U.N. or United Nations NATO command. You ever consider that Nixon closed the gold window because there was actually no gold left? You can’t audit invisible gold. Dear Louise, You are correct. I have added additional information in the End Notes. Thank you for your remarks.